Our Krav Maga training at Fit and Fearless will equip you with the tools necessary to defend yourself against any real-world threat. You'll quickly master the most efficient and effective combat and defense strategies offered anywhere in Austin. 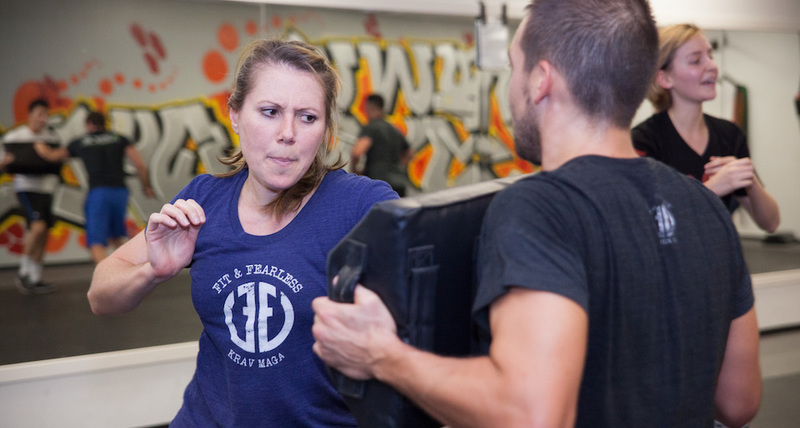 Our highly skilled instructors have designed Krav Maga programming for men and women of all ages and experience levels and we invite you to join the collaborative community of athletes training and protecting themselves every day at Fit and Fearless. We believe strongly in the principles taught within the Krav Maga discipline and we encourage participation as early as possible. In addition to the potential life-saving self-defense tools our students learn, Krav Maga also offers some of the best total-body workouts you've ever seen. Womens Only Krav Maga: The first Wednesday of each month at 7:30pm we host Wonder Women Wednesday. This class is free and open to anyone in the public who identifies as female. The other Wednesdays of the month at 7:30pm are also ladies only classes that are open to members and to the public for a $15 drop in fee. Each month we will introduce a new theme at WWW and then continue to build on that theme in the following weeks. Adult Krav Maga: All Krav Maga classes aim to give you tools for defending yourself. Along with combative and defensive techniques, we teach you to be aggressive in the face of an attack, to fight through fear and confusion and go home safe. As you progress through the system, you learn more strategy and tactics and how to apply those with a cool head in a violent situation. There's no better way to melt away calories and build lean muscle than with Krav Maga's high-energy training sessions. During each class, you'll push your entire body through a series of movements and exercises that will help you master the discipline. Take Your Workouts To The Next Level - Sign Up Today! If you're bored with traditional workout programs or just looking to start training again after some time off, look no further than Krav Maga at Fit and Fearless. We'll help you develop the mental and physical tools needed to succeed in all walks of life. To get started, simply fill out the form on your screen now or CLICK HERE to book your appointment!